Emerging markets are the key focal point when considering smartphone and mobile internet access growth. According to the latest market study by International Data Corporation (IDC), in 2013 the worldwide smartphone market surpassed 1 billion units shipped -- that's up from 752 million in 2012. This boom has been mainly powered by consumption in the China market, which has tripled in size over the last three years. Did you know that China accounted for one out of every three smartphones shipped around the world in 2013, equaling 351 million units? But the surge in growth has started to slow as smartphones already account for over 80 percent of China's total phone sales. The next half billion new smartphone customers will increasingly come from poorer emerging markets, notably India and the African continent. "The China boom is now slowing," said Melissa Chau, senior research manager at IDC. "China is becoming like more mature markets in North America and Western Europe, where smartphone sales growth is slackening off." 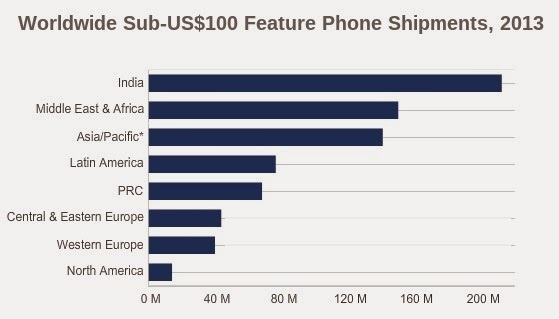 Emerging markets in Asia-Pacific outside of China, together with the Middle East and Africa, Central and Eastern Europe, and Latin America, account for four fifths of the global feature phone market, according to IDC data. This is a very big market opportunity. IDC estimates that 660 million feature phones were shipped last year, which could add two thirds to the size of the current global smartphone market. India will be key to future smartphone growth as it represents more than a quarter of the global feature phone market. Growth in the India market doesn't rely on high-end devices like the iPhone, but in low-cost Android phones. Nearly half of the smartphones shipped in India in 2013 cost less than $120. Converting feature phone sales to smartphone sales implies a relentless push towards low cost. IDC research shows nearly half the mobile handsets sold across the world have retail prices of less than $100 without sales tax. Two thirds of those have prices of less than $50 -- and that's the pricing trend, downwards. The opportunity gets larger the lower the price falls. If you take retail prices without sales tax, in 2013 nearly three quarters of the $100-125 price tier was already accounted for by smartphones. Within $75-100 the proportion was down to just over half, and between $50-75 it was not much more than a third. Many smartphone vendors have begun gearing up for this next wave of pricing pressure. Samsung is increasingly switching production to Vietnam, where manufacturing costs currently undercut mainland China. Even Hon Hai, one of the largest contract manufacturers for handsets in China, has announced plans for a plant in Indonesia to furnish a lower production cost base.